If you’re looking for some Easter themed fun this long weekend, Vancouver offers plenty of options. Here is a list of the city’s most popular Easter activities to partake in over the holiday. Stanley Park Easter Train – This long-standing tradition transforms the Stanley Park Miniature Train into an Easter Train! The kids will love riding the rails through a decorated forest, and they may even catch a glimpse of the Easter Bunny through the trees. The train ride ends in an Easter egg hunt around the grounds. Undoubtedly one of the most popular Easter events for kids, and open to all ages, the Stanley Park Easter Train is a must for any family. Open March 29 to April 2, from 10am to 5pm. Golden Easter Celebration – This Easter extravaganza occurs at the River District Neighbourhood Centre from 10am to 1pm on Sunday, April 1. All sorts of free activities, crafts, face painting, and of course a Golden Egg Hunt take place throughout the afternoon. Spaces in the Easter egg hunt are limited, so make sure you sign your kid up in advance. Family Favourite Movies – If you’re looking for a more relaxed way to spend the afternoon, check out the animated film Hop featuring the Easter Bunny for just $2.99 at select Cineplex theatres over the long weekend. International Village Cinemas is also showing Hop at 11am on Saturday, March 31. Easter Bash at Broadway Church – There are lots of free Easter events occurring over the long weekend, but this particular event is a family favourite. With over 20,000 Easter eggs up for grabs, pony rides, bouncy castles, and carnival games, join in the festivities at the Broadway Church between 11am and 1pm on Saturday, March 31. Burnaby Central Railway Season Opening – Good Friday marks the grand re-opening of the Miniature Burnaby Central Railway, located adjacent to the PNE in northwest Burnaby. Kids of all ages can enjoy taking a ride aboard this 1/8th scale model miniature train. The track runs around a six-acre park and is open from 11am to 5pm. A real treat for train lovers young and old. Easter Brunch – A long-standing favourite of locals and guests alike, Oceans 999 will be holding its annual Easter Brunch this Sunday from 10:30am to 2:30pm. Our special Easter menu features a variety of delicious dishes and desserts. View our full Easter Brunch Menu here and reserve your spot today by calling 604.895.2480. 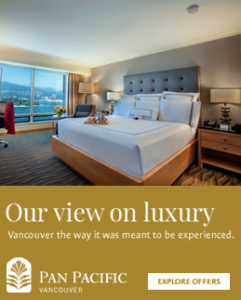 If you’re visiting Vancouver this weekend with your family, come stay with us at the Pan Pacific Hotel! We still have a few rooms available at an exclusive Easter discount of 20% off the standard rate, breakfast for 2 kids (12 and under) and 2 adults included. View full Easter offer details here. Enjoy your long weekend and Happy Easter from the staff of the Pan Pacific Hotel!